In the years following Unforgiven (1992), Clint Eastwood's career as a director has been decidedly uneven. Films such as A Perfect World, Absolute Power, and True Crime frequently contained attractive ideas and characters, but something was missing. His adaptation of Midnight in the Garden of Good and Evil was widely panned. More so than most directors, Eastwood needs a good screenplay to work with. He's not a writer himself, so he typically expects the screenplay to be good plan of what the final movie will look like  not just a beginning point. As a result, Eastwood's films tend to sink or swim on the quality of their screenplays. 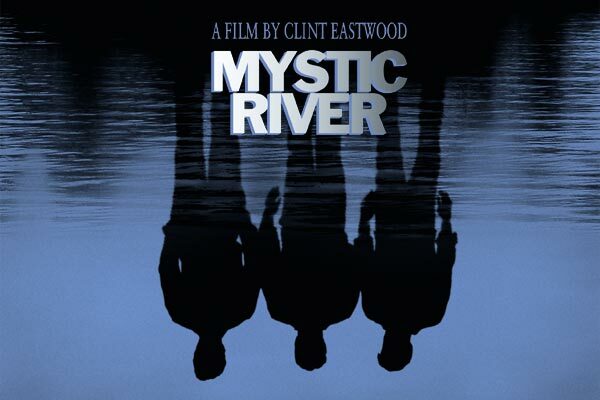 With Mystic River, Eastwood gets a good screenplay. Based on a novel by Dennis Lahane and adapted for the screen by Brian Hoagland (who has written the good, L.A. Confidential, and the bad, The Postman), Mystic River is a solemn and respectful drama that provides us with the complexities of life with few of the simplifications that Hollywood typically enforces on its products. The characters in Mystic River aren't simply good or bad. They're somewhere in between. They exist in a painful and confusing world where concepts such as honor and friendship can be turned upside down and revealed as specious constructs. They exist in a world where painful events from the past hang overhead like dark clouds, forever ready to rip open in a storm of suppressed memories. Mystic River tells the story of what happens after a 19-year-old woman is murdered. Set in the working-class neighborhood of East Buckingham in Boston, Mystic River gives us a trio of friends who are forever linked by a terrible event from their childhood: while they were playing on the street where they lived, one of the boys, Dave, was picked up by two men pretending to be police officers and held in a basement for four days as they molested him. After he escaped and returned home, the boys stopped playing together and they drifted apart, each going a separate way. Jimmy became a thief, who served a two-year stretch in prison and then went straight, raising a daughter in the process and remarrying. Sean became a police officer, with an estranged wife and son. And Dave never shook the specter of the past. His every movement is a portentous reminder of the burden that he carries. He lives in the same neighborhood where he grew up, with his wife and son. Maybe he should've moved away and began life fresh, without the constant reminders that the neighborhood provides. Jimmy also stayed in the same neighborhood, building a good business as the owner of a corner convenience story. Only Sean moved away, but he is pulled back to East Buckingham when Jimmy's daughter is murdered. Sean and his partner handle the police investigation, which brings Sean, Jimmy, and Dave together again. Jimmy is devastated by his daughter's murder. "I know in my soul I contributed to your death," he says, "but I don't know how." Upon his release from prison many years ago, he dedicated himself to becoming a good father, so Katie became the means by which Jimmy reformed himself. Therefore her death shocks him to his very core  particularly the apparent senseless nature of the crime. "Why?" he pleads. But good answers are difficult to come by, and when we learn why she died (Jimmy never really learns the entire story), the answers hit like a blow in the stomach. Mystic River unravels as part mystery, part police drama, and part character study. As a mystery, it's quite compelling. I've seen so many movies, particularly mysteries and crime dramas, that I typically recognize the various patterns and know where a movie is going from early on, but Mystic River has some surprises in store for its viewers and those surprises aren't exactly easy to see coming. As a police drama, it's a bit more routine, with a low-key approach that eschews the high suspense of most crime dramas. As a character study, Mystic River is a mixed bag. It gives us the superb (Sean Penn as Jimmy), the so-so (Kevin Bacon as Sean), and the hardly credible (Tim Robbins as Dave). Penn lights up the movie whenever he's on screen. We sense his pain in every scene and we sympathize with him, but we also know Jimmy is a dangerous man. His old cohorts from his days as a thief eagerly follow his orders (he wants to find the killer before the police)  as if he were a minor crime boss. Kevin Bacon and Laurence Fishburne form a comfortable homicide investigation team. Like an old married couple, they know each other and work together well, and they become better as a team when they listen to each other. And Tim Robbins gets the unenviable task of playing the eternally sad Dave, who always looks as if he's carrying a tremendous burden on his shoulders. Robbins is so preoccupied with the character's pain that he never figures out what made Dave an attractive husband or a good father. Likewise, there's a problem with how Dave's wife (Marcia Gay Harden) responds to her husband. There's an entire story here that the movie never reveals. (I know that's vague but that's all I can say without revealing some major plot points.) And with this sketchy, one-dimensional approach to Dave and his wife, the movie falters severely. However, Sean Penn gets most of the attention and screen time, and he's so good that he compensates for many of the movie's shortcomings. His Jimmy is overcome by grief, but Penn manages to suggest many other facets of Jimmy's character. We know he can be a fiercely devoted husband and father, we know his family and friends enjoy his presence, and we know he can be funny and warm. In contrast, the character of Dave is monotonous. Eastwood treats these characters and situations solemnly  maybe to a fault. This isn't the kind of movie that really gets you excited about cinema. Eastwood is so careful about always treating this subject with respect that he conveys little sense of wonder and excitement. Instead, we get a dirge-like rhythm that continuously stresses the seriousness of the situations. It's hard to fault Eastwood for the respect and consideration that he conveys, but I know I won't return to Mystic River any time soon, unlike Unforgiven, which transcends its brutality and somber tone to achieve some magnificent, invigorating moments that convey the power of cinema. There's nothing like that in Mystic River (which probably works better as book by allowing us more room to enter the minds of its characters). Eastwood has crafted a workman-like film of great power and weight, but in terms of inspiration, it's a curiously muted effort.